2000 Yamaha Venture XL Skidoo. In good working condition with 9300 km. 2001 Skidoo Grand Touring 500 Rotax in excellent condition. Electric Start, 2 upseat, hand and thumb warmers , reverse and led under lighting. Cover. $2200.00 Email or text 7097548687. 700 triple Sx Viper excellent condition, 136” track with 1 1/2 paddles. Skidoo got reverse and has 15,000 kms. Call for more details. Make an offer!! Skidoo touring SLE 500 fan cooled. Electric start. Push button reverse. All new bearings and shock, bushings etc in suspension. Track is good. Very light use. 9500kms. Runs great. Also have the registration. Selling a 2004 polaris edge touring 550. 136 inch track. 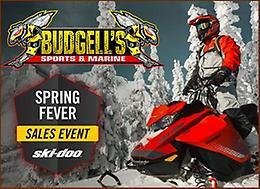 Skidoo has heated hand and thumb warmers , electric start , reverse, good shape and runs well. Track is also in good shape. Always kept in side. Call 687-2828 or 437-6878 for more information.